MOVIE legends such as Robert Downey Jr and Samuel L Jackson are set to fly into Edinburgh to film the new Avengers movie. Imagine the hammer-wielding Marvel hero Thor as he descends from Asgard onto the crest of Arthur’s Seat. A scene that, come April 2018, might not be so far-fetched after it emerged producers have picked Edinburgh as a filming location for the next Avengers movie. Scarlett Johansson, Robert Downey Jr, Chris Evans and a host of other A-list Hollywood stars could assemble in the Capital for the shooting of the £400 million blockbuster Avengers: Infinity War at the end of next month. 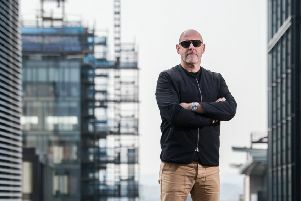 Filming is understood to be due to start on February 28 for around six months and executives have been scouting locations across Edinburgh, Glasgow and the Highlands. Remaining tight-lipped on full cast or location details, Disney, the movie’s producer, has confirmed Chris Hemsworth as Thor and Chris Pratt as Star-Lord. The movie’s main villain, Thanos, will be played by Josh Brolin and fans can also expect appearances from Jeremy Renner (Hawkeye), Samuel L Jackson (Nick Fury) and Benedict Cumberbatch as Dr Strange. Edinburgh College performing arts graduate Karen Gillan is also rumoured to be resurrecting her role as Nebula. The former Doctor Who actress first played the character in Guardians of the Galaxy in 2014. Marvel fans across the Capital were ecstatic that their big-screen superheroes would be touching down on Scottish soil. Edinburgh-based film critic Stephen Carty said: “This news is very exciting. “Even if you don’t like Marvel movies, Infinity War is going to be a massive film, and it will give a huge boost to the local economy. “Local businesses are sure to benefit and it can only be a good thing for the Scottish film industry. “Plus, film fans and star-spotters are bound to be excited about the prospect of seeing Hollywood superstars in Edinburgh. I’d love to bump into Robert Downey Jr or Scarlett Johansson on Princes Street. Avid Avengers fan Clare Hutchison, from Abbeyhill, said: “I love Chris Evans and Chris Pratt so the possibility of spotting them around Edinburgh would be great.